I take Digestzymes by Designs for Health with every meal for help digesting. Has the right mix of enzymes. You probably want to keep it quiet if you’re suffering from digestive problems: they may be painful‚ irritating‚ or just plain embarrassing. Fortunately‚ you won’t have to hide anymore if you get rid of them! 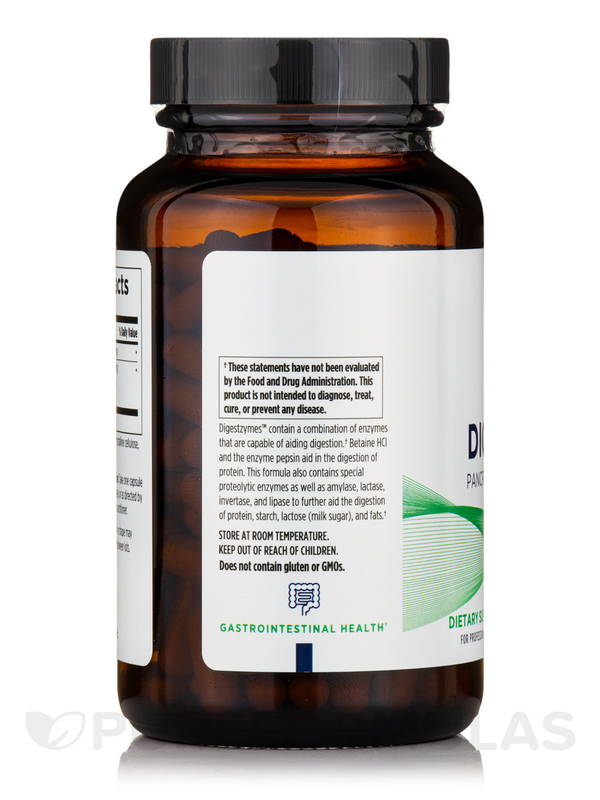 Digestzymes is a full-spectrum pancreatic enzyme supplement created specifically to promote digestive health. Insufficient digestion can lead to digestive problems such as cramping and diarrhea. It can also lead to more severe problems such as high blood pressure‚ plaque in your arteries and much more. For these reasons‚ it is important to have the right amount of enzymes in your digestive system so your body can digest and absorb the nutrients it needs. 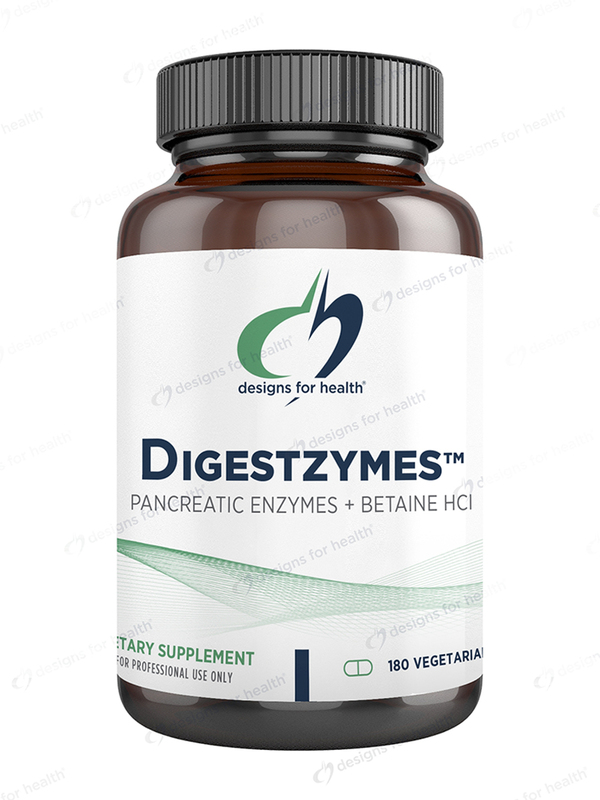 Betaine HCl is the main ingredient in Digestzymes; it provides hydrochloride‚ which helps break down food in your stomach. This ingredient will establish a healthy balance of stomach acid if your levels are too low. Since a deficiency in those acids hinders absorption‚ it could cause other severe health problems. 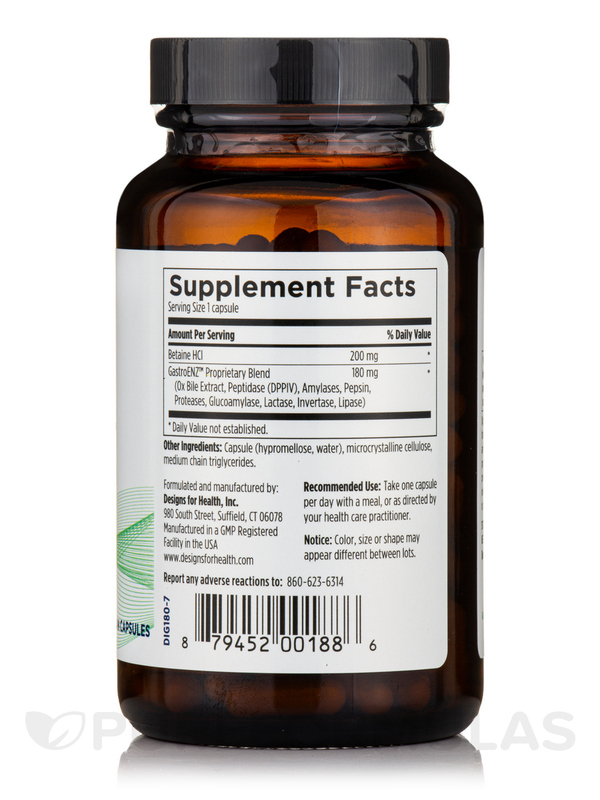 As a result‚ betaine HCl helps you effectively absorb certain needed nutrients. Protease (acid protein and DPPIV) to break down protein. Amylase to help break down starch‚ which is naturally produced in the pancreas. Lipase helps break down certain fats during the digestive process‚ and is also produced by your pancreas. Pepsin converts proteins into amino acids during digestion. Ox bile extract works to digest and absorb fats. Lactase to digest lactose‚ which is contained in dairy products. Glucoamylase allows your body to use starch by converting it into glucose. Invertase metabolizes and digests a type of sugar known as sucrose. Diastase break downs carbohydrates and turns them into sugar. To prevent gas‚ bloating‚ and constipation while maximizing the absorption of nutrients‚ use Digestzymes before every meal. 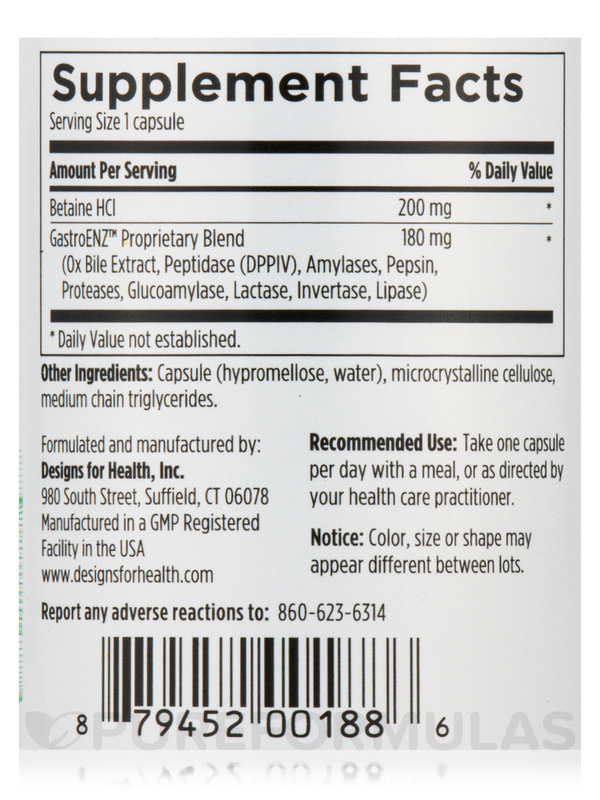 This 180-capsule bottle is made to last several months for those with long-term or reoccurring digestive issues. Ox bile extract‚ peptidase (DPPIV)‚ amylase‚ pepsin‚ proteases‚ glucoamylase‚ lactase‚ lipase‚ invertase. Guaranteed GMP Complaint Product / Made with Non-GMO Ingredients / Gluten-Free. I take Digestzymes by Designs for Health before each meal daily and it has helped me with keeping my digestion on track, especially since I started having trouble as I've gotten older. Will continue to use this product. 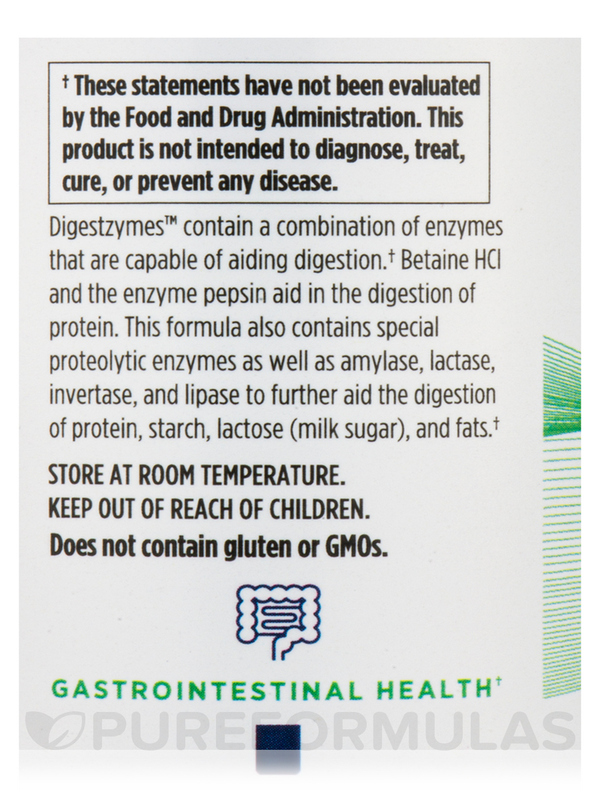 These Digestzymes by Designs for Health are great digestive enzymes but darn pricey so I had to stop taking them because my system was not absorbing well and I needed to take too many. It works well to encourage through digestion. My naturopath recommended this Digestzymes by Designs for Health. Now I don't need to take ox bile separate. More powerful than most enzymes. Runs out fast. Better get the larger bottle. 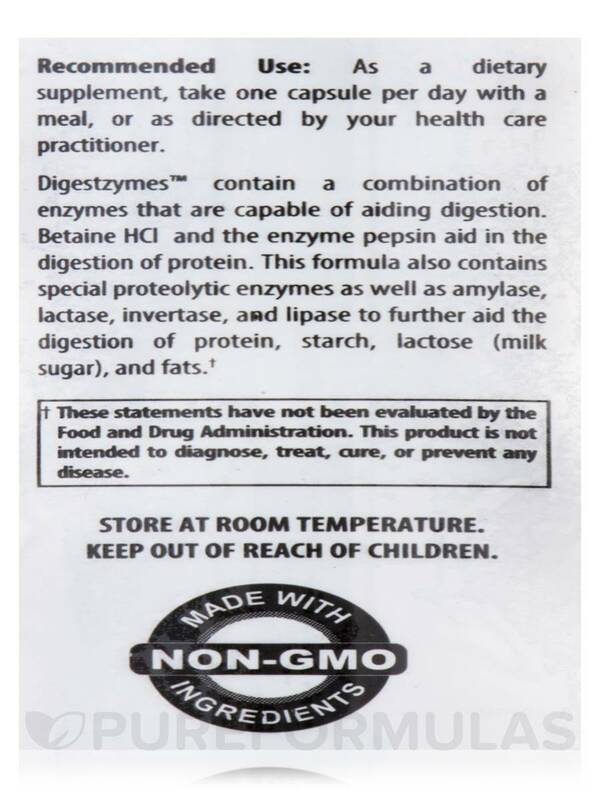 Digestzymes by Designs for Health works, however, it is pricey and it contains stearate. Metabolic mess to nutritional superstar! My doctor is an internist and the best in the state and possibly the best in the US. He ran testing on my metabolism and nutritional levels and I was a mess. It has been two years now since I began taking Digestzymes by Designs for Health, and he ran the testing again and tweaks it here and there. According to the testing it's all working now!!! I'm using Digestzymes by Designs for Health for help with digestion and low stomach acid. It's the first digestive supplement I've found that doesn't make me sick! My Naturopath recommended Digestzymes by Designs for Health for me over one year ago. I am very sensitive to many supplements and I can tolerate these with no problem. They have been helping my digestion and acid reflux. Betaine HCL & digestive enzymes in one pill. A bit expensive like all good supplements. Digestzymes by Designs for Health is expensive but helps with digestion. It helps break down food making digestion easier. I am taking this product over 3 years. I am taking powder not the capsules. It tastes good fast dissolves. I tried capsules once but had a synthetic taste so I switched for powder. It has to be kept in the fridge and away from moisture. Thank you for reaching out to us, Dolores. This product is GMO-free.